The chemical bisphenol-A (BPA) is a component of the polycarbonate plastics used in everything from eyeglass lenses to sports equipment to baby bottles. Because the body can mistake BPA for the hormone estrogen, the chemical has attracted fear and loathing from parents who don’t want their infants imbibing BPA from a baby bottle. Chemical structure of estradiol, one of three naturally occurring estrogens in women. Rollover: Bisphenol-A (BPA) is similar enough to “mimic” estrogen. 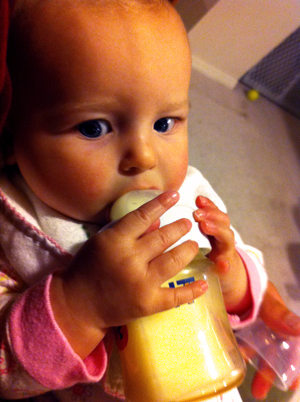 Amid a wave of concern in many countries, several U.S. states have banned BPA from baby bottles. You might not want your fish mating in a broth of BPA, either. A study published Wednesday shows that low levels of BPA increased the rate of inter-species courting between two related fish species. 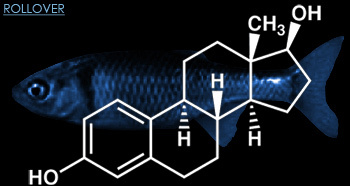 The study did not test for actual mating (in which the male deposits sperm onto eggs laid by the female), but it did suggest that BPA could contribute to fish declines, even extinctions. In the Southeast United States, for example, the native blacktail shiner Cyprinella venusta is being displaced by the red shiner C. lutrensis. Ward, J. L. & M.J. Blum. Exposure to an environmental estrogen… Evolutionary Adaptations, 2012. 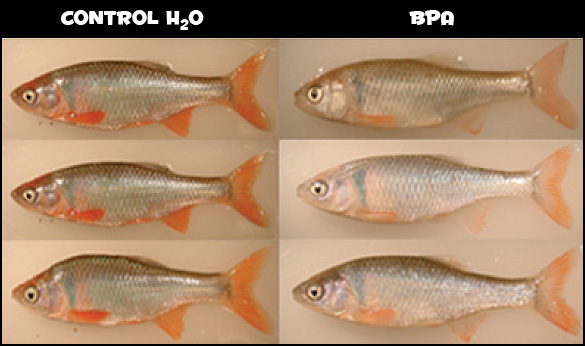 Male red shiners show color variations after swimming in water with BPA. Secondary sexual characteristics are controlled by hormones and can be disrupted by hormone mimics, but the change may not explain the cross-species mating behavior. 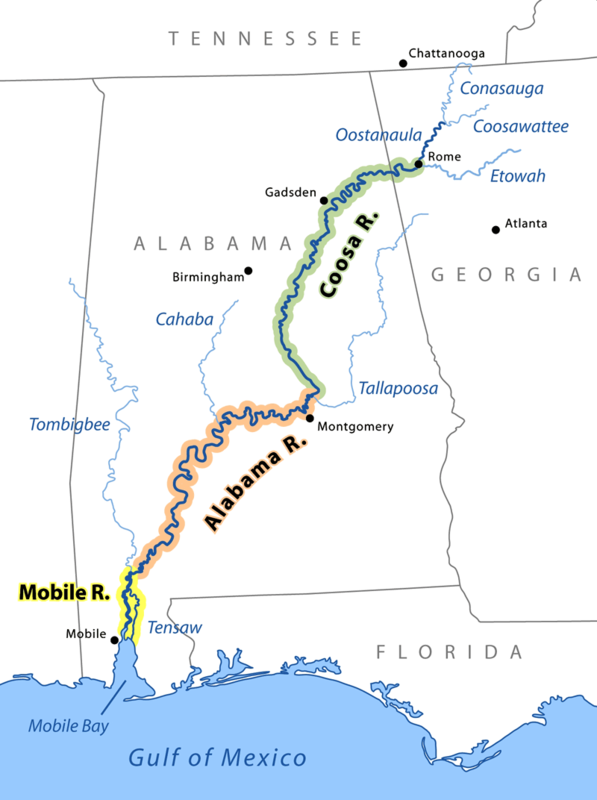 Blacktail shiners in the Coosa River are declining as red shiners invade and cross with them. Does the endocrine disruptor BPA feed this process? To find out whether the hormone-mimicking BPA could feed this hybridization, Ward and Michael Blum of Tulane University exposed shiners to a dilute BPA solution or with plain water. Red shiner males lost most of their distinctive red coloring in the BPA bath, a change consistent with hormone disruption. If baby bottles leach the hormone disruptor BPA, what happens to the baby? 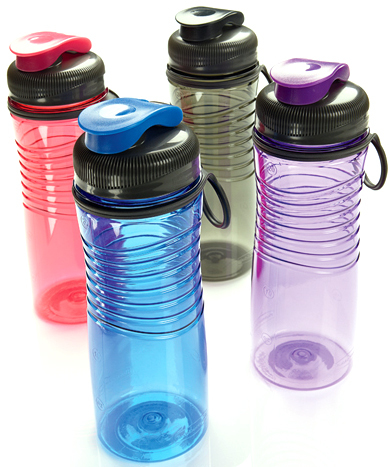 Faced with fear of endocrine disruptors, manufacturers are introducing BPA-free bottles. BPA is in watery ecosystems across the United States, although at lower levels than the 1,280 micrograms per liter concentration used in the study. The level was chosen to be comparable to previous studies. Although the researchers did not study whether eggs were cross-fertilized after this courtship, they did document a breakdown in “reproductive isolation,” that would allow new species to enter an ecosystem and create hybrids at the expense of the natives. Something fishy about this courting!